Europcar, global leaders in car hire, was today unveiled as official partner to the 2018 Rás Tailteann, Ireland’s premier cycling event which attracts 31 teams (12 international and 19 domestic) and 155 riders. 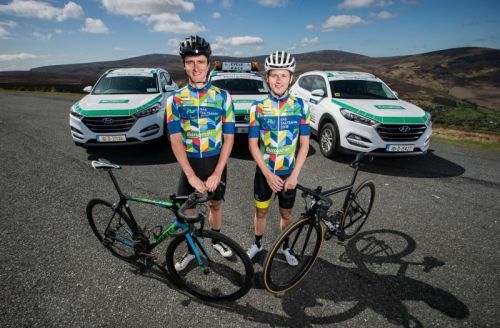 Team Ireland cyclist, Marc Potts and Team Leinster cyclist, Mark Dowling attended the official launch event and will represent Ireland in the historic race taking place over eight days from May 20th to 28th, covering a total race distance of 1168 kilometres. 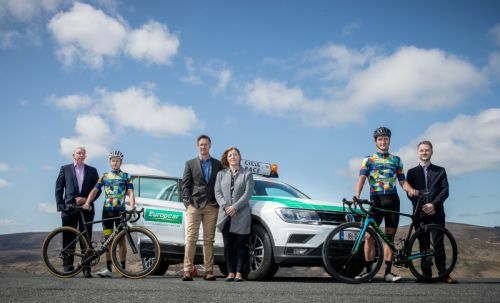 Supported by its nationwide network of branches, Europcar will provide a fleet of support cars and vans allowing the Rás to fulfil all of their transport needs including lead car, event logistics, delivery and photography cars over the eight day event. 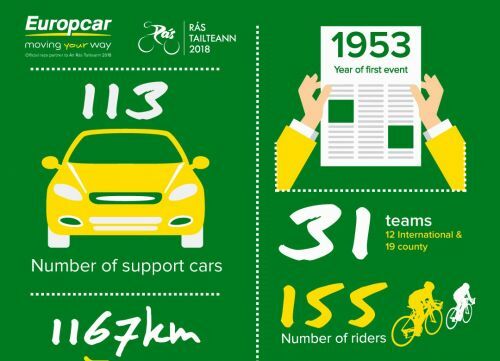 To celebrate the partnership, Europcar is offering one cycling fan and their friend the exciting opportunity to follow the Rás in a truly unique fashion by traveling in the official lead car driven by Irish cycling legend Laurence Roche for a stage. Europcar will provide the winner with one night’s accommodation where they will have the chance to rub shoulders with the stars of the Rás. Europcar has also taken ownership of the prestigious, ‘King of the Mountain,’ jersey which is awarded to the rider with the most mountain points at the finish of each stage. Points are awarded to leading riders passing each designated summit with extra points on the most severe climbs and fewer points on less severe climbs. 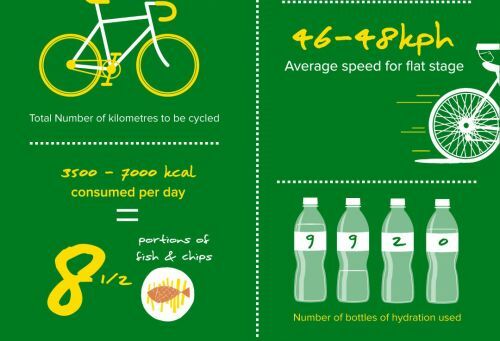 The rider with the greatest number of points at the end of the race is the Rás Tailteann Europcar King of the Mountain. From L-R Paul McNiece (Sales Director, Europcar), Mark Dowling (Team Leinster cyclist), Eimear Dignam (Race Director, An Rás), Jon Jerromes (Head of Business Fleet Services), Marc Potts(Team Ireland cyclist) and Shane Maguire (Business Fleet Executive, Europcar). “We’re delighted to announce our partnership with An Rás Tailteann. As a cycling fan, this is an event that is close to my heart and one that our business is uniquely positioned to support.